OK this is it. TM has finally announced that they’ve got new plans for both Streamyx and Unifi customers. These include a new entry-level Unifi plan, new “turbo” Unifi plans, a special upgrade package for pre-Unifi (aka Streamyx) subscribers and an unlimited Unifi Mobile mobile postpaid plan. This, I think, is by far the biggest announcement of today. The people have been asking for a more affordable way into Fibre and it looks like this could it. So far, details surrounding this plan are still vague, but here’s what we know. First, this will be designed to be the new entry-level Unifi plan that’s designed for users in the B40 (bottom 40% income group) segment. 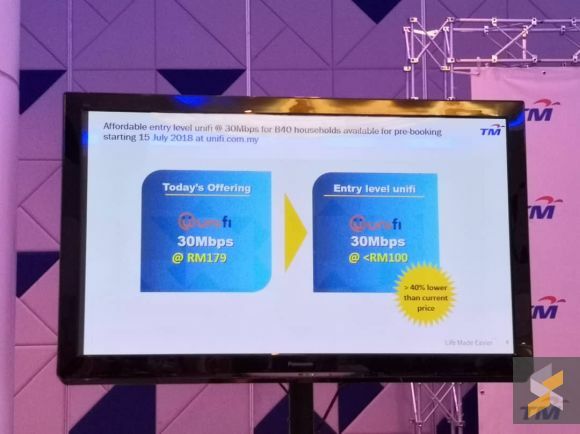 Although TM hasn’t revealed how much this plan would cost exactly, they did say that this new Unifi plan will give users a speed of 30Mbps for below RM100. TM also said that this plan will be offered at a price point that’s 40% lower than the existing 30Mbps package. This makes it the cheapest 30Mbps Unifi plan TM has ever offered. The last time TM had a Unifi plan for less than RM100, it was the Unifi Edu plans for students, but that was only for 24 months and had a speed of just 10Mbps. However, they also said that this plan would be unlike the current 30Mbps plan. They didn’t specify all the differences, but they did say that it would be an “internet-only” plan. This likely means that it won’t come bundled with add-ons like Unifi TV or calls. Although, in an extreme case, it could also maybe mean a BYOD type of solution where you would need to buy your own modem. That said, this BOYD solution is merely speculation on our part. TM added that more details regarding this plan will be revealed on the 12th of July 2018 and that the company will be opening registration for pre-booking customers at unifi.com.my on the 15th of July 2018. Frankly, I think this can potentially be a very interesting plan because I’m sure there are many out there who’d want an internet-only Unifi plan, without add-ons like Unifi TV or calls — I know I personally would. This is where things get a little bit tricky. 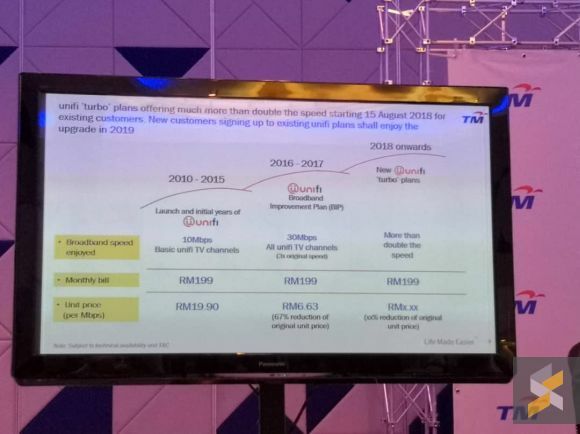 TM announced today that there would be new Unifi “turbo” plans and that these plans will be offering “much more than double the speed” of the existing broadband. What’s more, they also said that TM will be upgrading the speed for all its existing Unifi subscribers at more than double the speed for no extra cost starting 15 August 2018. Finally, TM revealed that new customers subscribing to existing Unifi plans before 31st December 2018 will be “upgraded accordingly in 2019”. Therefore, it looks like these new “turbo” plans aren’t exactly new plans. Instead, they are plans to upgrade existing plans depending on when you subscribe. If you’re an existing subscriber, you can expect to have your existing speed more than doubled for no additional cost. On the other hand, if you’re planning to subscribe and you subscribe before the end of this year, you’ll only be getting your speed upgrade next year. It doesn’t sound like there will be specific new Unifi turbo plans right now, but I guess all will be revealed on the 12th of July. While upgrades and new plans for Unifi subscribers are great, TM also has a special upgrade package for pre-Unifi/Streamyx subscribers. Considering the fact that more than half of TM’s 2.33 million broadband subscribers are still on Streamyx, this will hopefully give people incentive to upgrade. Unfortunately, TM hasn’t revealed much regarding these plans so we’ll have to wait and see what they have in store for these Streamyx subscribers. However, they did announce that Streamyx users can check their eligibility status on unifi.com.my from 15th July onward. Finally, TM also revealed that they will be relaunching their unlimited unifi Mobile postpaid plan. This will give users unlimited data, calls and messaging. However, this new plan will serve as a “convergence offering” that’s exclusive to existing broadband customers and will be available at all Unifi outlets (and online) starting 15 July 2018. 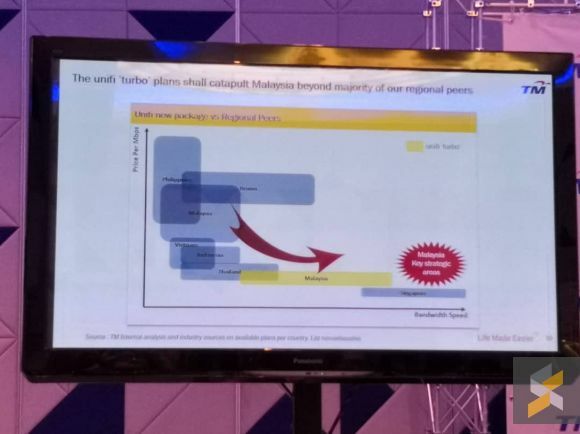 Will these new plans solve Malaysia’s internet problem? Yes, new plans are great, especially when these new plans are designed to be affordable, but it’s hard to say how much this will impact Malaysia’s big broadband problem: Availability. From what we’ve seen, a lot of people want to subscribe to Unifi and stop paying for the expensive yet slow Streamyx speeds. But, they simply don’t have the option to do so for a myriad of reasons that are beyond their control, for example, the lack of Unifi ports. 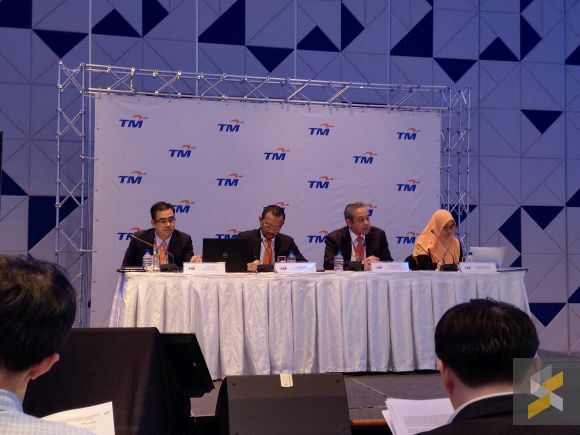 TM did touch on this topic during the media briefing, saying that they will continue investing in their network to provide users — who don’t currently have access to Unifi — at least, access to their 30Mbps base plan. 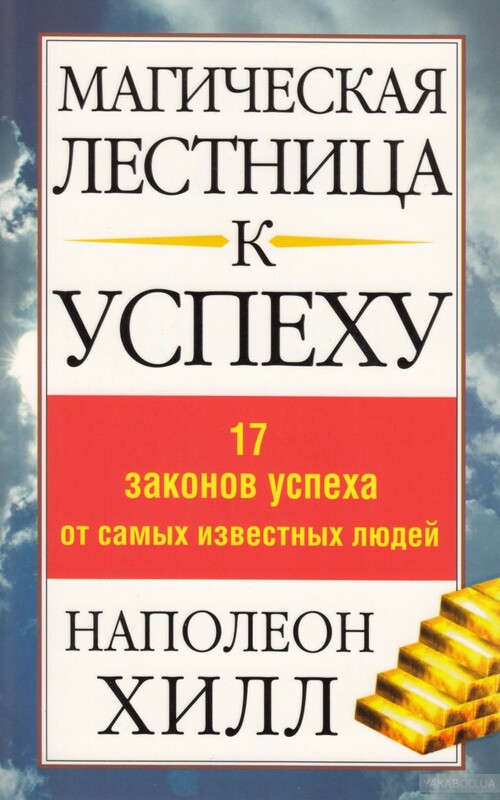 And, they said that they will do that “through the latest technologies that will be a mix of both fixed and the latest wireless technologies”. In other words, Unifi may not necessarily come to you in a fixed or fibre method, it could also leverage wireless technologies too. They didn’t specify what forms these wireless solutions may come in, but we’re guessing they could be referring to something like TM’s Unifi wireless broadband. Then, there’s the issue of the 1.4 million underutilised Unifi ports nationwide — which, by the way, is more than their 1.13 million Unifi subscribers — and why users weren’t getting on Unifi. To that, TM answered that they rolled out these ports not based on demand, but on supply — which also means they built the ports in anticipation of future. They also said that in some locations, users weren’t picking up fibre networks because of behavioural reasons, like a preference for wireless broadband instead of wired. One example they provided was about people who rent instead of buy property, which makes sense because those who move around a lot probably don’t want to be tied down by fibre solutions. We suspect it could also be because of the high bar of entry fibre poses to your average user. The most affordable Unifi plan right now is the Unifi lite plan which gives you 10Mbps for RM129. If TM can drop that bar of entry to below RM100, we could see more people subscribing to Unifi. So, while we don’t think this will instantly solve all our internet problems, we think it is at least a step in the right direction. Either way, we should be getting a lot more details on these plans next week, the 12th of July 2018, so stay tuned for that. In the meantime, let me know what you think of this in the comments below!